PASADENA - Despite overwhelming community support for the embattled activist Jasmine "Abdullah" Richards, who rose to prominence as a youth organizer in the resource-deprived African-American community residing in otherwise-affluent Pasadena, a jury unanimously convicted her of the charge of "attempt to taking a person from police custody by means of a riot," a charge up until very recently known as felony lynching. At yesterday's court hearing, presiding Judge Elaine Lu sentenced the activist to 90 days in LA County jail, three years' probation, and a year of anger management classes. The the feared stayaway order from La Pintoresca Park, the hub of Black Lives Matter organizing in Pasadena, was averted. 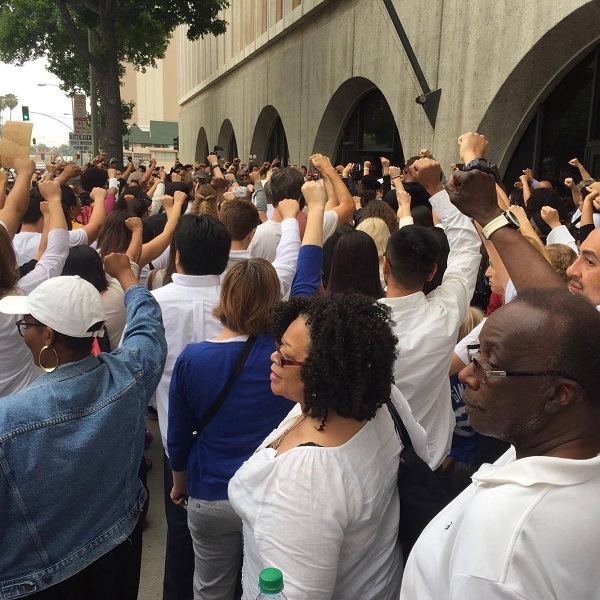 Hundreds of people gathered outside the Pasadena branch of the LA Superior Court yesterday--by some estimates as many as a thousand--to show their support for the victim of this legal lynching. Many wore albs, frocks, and otherwise visually displayed their status as clergy. The spirited crowd chanted, sang, danced, and held signs and banners, but also paused to listen to speakers during the two press conferences, one held prior to the hearing and the other held after the sentence was conferred. 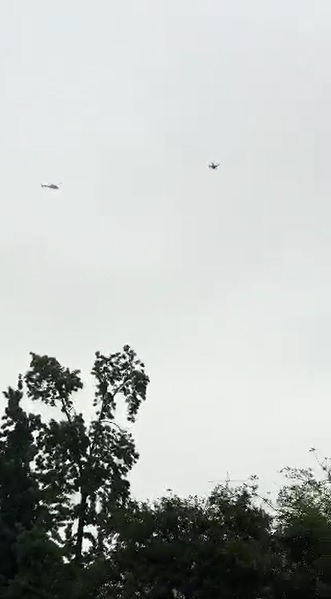 Police presence was relatively light, given the circumstances, but a police helicopter whirred ominously overhead the whole time, and a drone was also observed although it was unclear who was operating it. 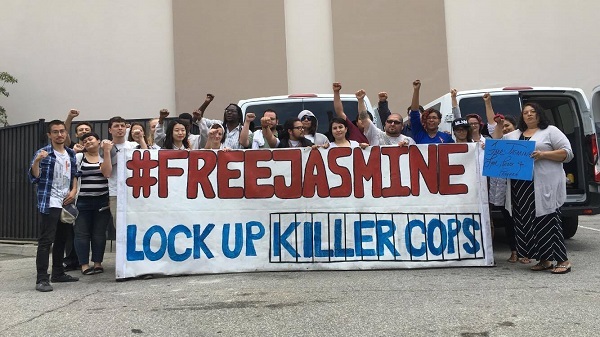 One of the crowd's chants called for authorities to "Free Jasmine Right Now!," but the concrete demand made by the leadership was for the judge to not sentence Jasmine to any jail time. (In criminal proceedings wherein the jury does not impose the sentence, judges have great leeway in their imposition of sentencing, including the possibility of suspending jail terms entirely. Such an outcome was sought in this case.) Given that the judge could have imposed anywhere from a year to four years in state prison, a 90-day sentence with credit for time served was perhaps among the most lenient consequences available. But the activists were not satisfied, the vast majority of them considering her a political prisoner who had been profiled, surveilled, harassed, and ultimately entrapped by police and maliciously prosecuted by the district attorney's office. Given that perspective, any sentence at all was considered unjust. To summarize briefly, Jasmine, now 29, grew up in Pasadena and suffered from the heavy hand of police as an adolescent. She even lost friends to police violence. When the black community of Ferguson, Missouri revolted after the 2014 killing of unarmed teenager Michael Brown by a white police officer, Jasmine was among the many who flocked to the city to show her solidarity with the struggle. 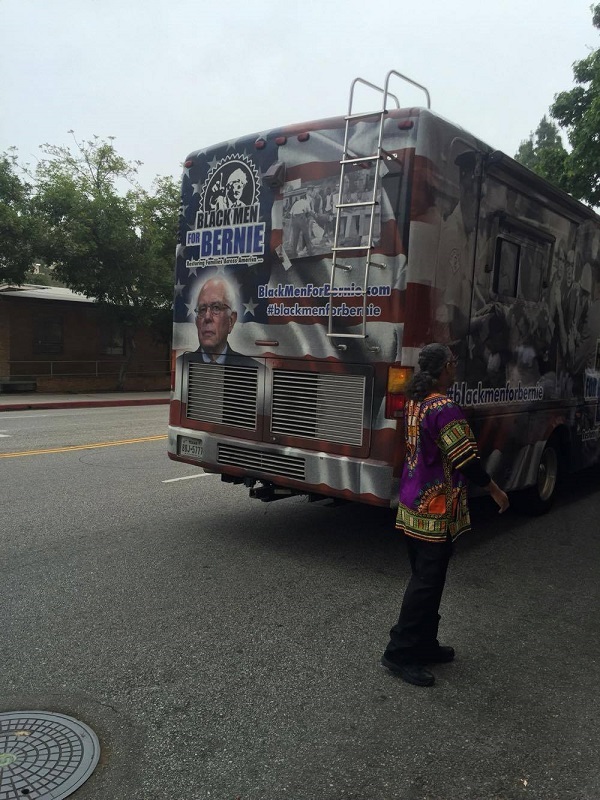 There she became politicized and returned to Pasadena determined to make a difference for her community. 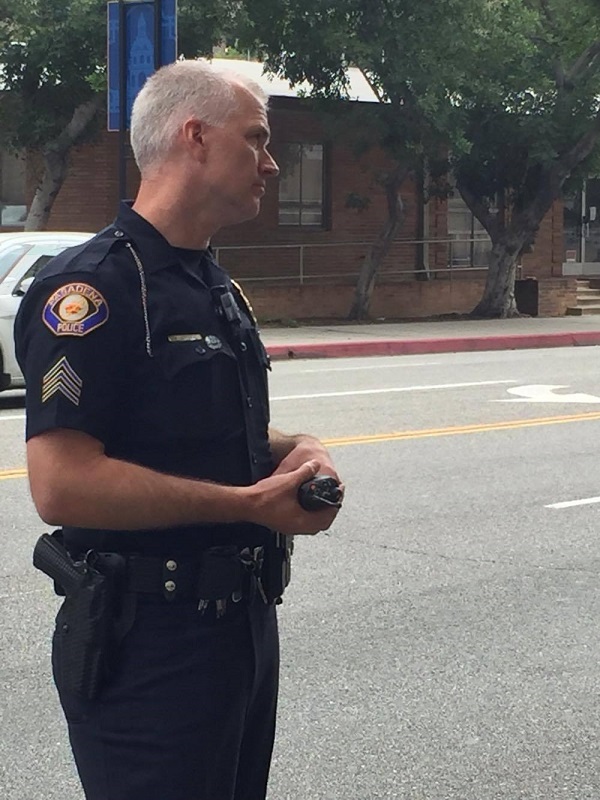 She began her efforts working with youth in the park, providing guidance, offering free tutoring, and becoming involved in the struggle for justice for Kendrec McDade, a 19-year-old unarmed black man murdered by Pasadena police in 2012, and other victims of the police in Pasadena and beyond. It was this political activity criticizing police murder that brought her to the attention of the Pasadena police department, which began monitoring and harassing her. She was arrested several times in the course of the Justice for Kendrec McDade campaign, including an arrest during an incident in which police also arrested an 11-year-old, before the incident that led to her arrest on the felony attempted lynching charge. In that incident, BLM 'Dena, as the Pasadena chapter of the organization is known, organized a peace march at the same park where youth sports and tutoring had been taking place--La Pintoresca. About 15-20 people, about half of them children, had gathered for the activity, when their attention was drawn to an altercation across the street. A black woman had ordered an horchata from a restaurant, but, being some 20 cents short, became involved in an argument with the clerk. Things escalated into physicality, and both subjects behaved aggressively toward each other. When the cashier called the police, however, they only criminalized the black customer and made no investigation or arrest of the store employee, who is Latina. Witnessing this disparate treatment, Jasmine and the other community members present intervened, at some point even forming a human circle around the black woman to prevent her from being taken into custody, where many people are murdered by jailers, die from medical negligence, or are killed by other inmates while guards stand either oblivious or complicit. Despite the intervention, the police did take the woman into custody. The incident was filmed and some of that footage has been published on the internet. Two days later, police returned to the park to execute an arrest warrant for Jasmine, who was there tutoring a student at the time. 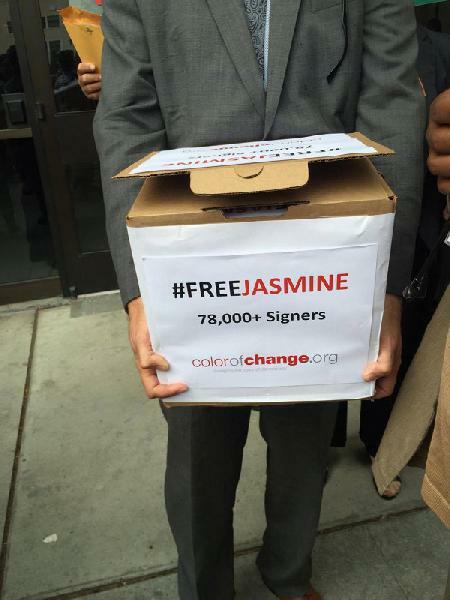 Thus began the "Free Jasmine" campaign. Many activists and community members contributed to the bail and legal defense fund, eventually allowing Jasmine to get out on bail. The courtroom was often full of supporters during the different phases of the trial. Of the 55 potential jurors called, only 2 were African-American. One of them was a pastor who was unable to serve due to his duty to perform a funeral service for a member of a family he had known for 30 years, and was therefore dismissed. 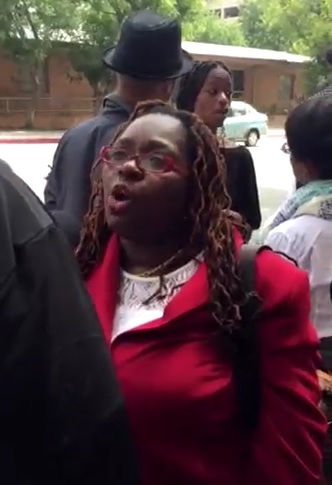 Efforts by attorney Nana Gyamfi of the Crenshaw Legal Clinic (also the Wednesday morning host of Uprising! on KPFK radio) to weed out racist jurors tainted by the Fox News portrayal of Black Lives Matter as the architects of a campaign of mayhem and police murder (ridiculous as it may be, that is the narrative Fox and other outlets are pushing and a lot of people, especially conservative whites, are buying into it) proved to be a challenge. One juror, who rolled her eyes when Ms. Gyamfi asked if any of the potential jurors had any strong reaction at all to the phrase "Black Lives Matter" and was questioned about it, denied having reacted at all (even though the gesture of ridicule was witnessed by all present in the courtroom) and was allowed to remain on the jury. Another potential juror, who admitted during voir dire that she could not be impartial in the face of massive police racism and violence against civilians, however, was summarily dismissed at the prosecution's request. The result was a jury completely devoid of black people. And while there were a few jurors of color, none of them were young. So she really did not have what we could consider a jury of her peers. The prosecution introduced several witnesses, all police, in the attempt to criminalize the defendant. One of the police officers, a young Latina, contradicted the statements of her older, white colleagues in admitting that she never saw Jasmine touch the person that was allegedly lynched. She also consistently referred to Jasmine as "the female black," while not referring to any other individual as "a" or "the" "male" or "female" "white" or any other race. As someone recently out of high school, it was evident that her racist manner of referring to African-Americans was the exclusive result of police training. The other evidence introduced by the prosecution was the police video footage of the incident. This was projected on a screen facing the judge and not visible to the audience in the courtroom. 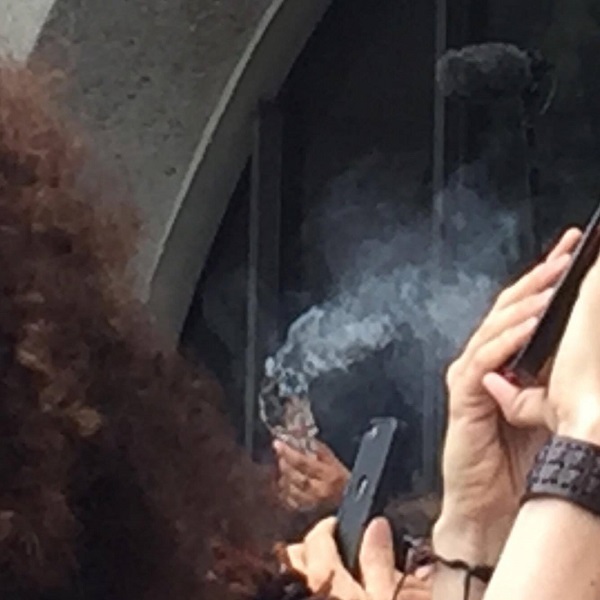 While it does not show anything incriminating, some of the black participants in the event were recorded using language considered foul by white amerika. Jasmine was not among their number. This led the prosecutor to characterizing the group as a "profane mob," only slightly veiling her racist intentions. Following the prosecution's probing of the witnesses and the defense's cross examination, there was much debate over what the jury instructions would actually be. But eventually the judge made her decision regarding jury instructions and closing arguments were made. During the prosecution's closing argument, she played to the Fox News slandering of Black Lives Matter by comparing the movement to the KKK. The jury deliberated for less than two hours before returning their unanimous verdict: Guilty. They were dismissed and the sentencing hearing was set for yesterday. Over the weekend, multiple actions were taken by community supporters. One of them was a petition launched by the national online racial justice group Color of Change. In a matter of days, the petition had garnered nearly 80,000 signatures. Another 18 million rising, and designed to place pressure on both the judge and the prosecutor in the case, both Chinese-American women, from within the Asian-American community, garnered over a thousand signatures. 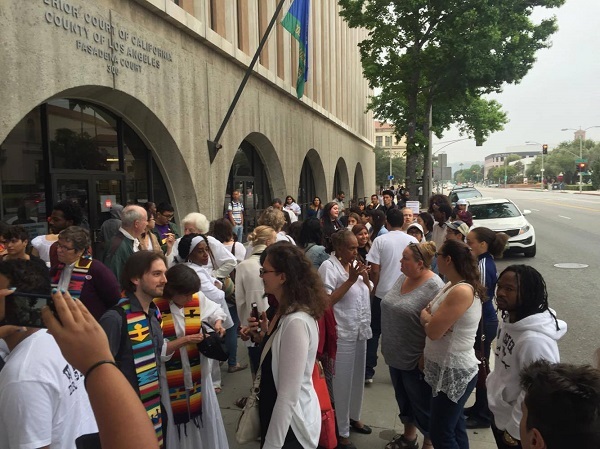 Other steps were a large planning meeting at Chuco's Justice Center in Inglewood at which approximately one hundred attendees introduced themselves, poured out libations, discussed strategy, and learned the steps of a dance to be performed outside the courtroom. The dance, inspired by Jasmine's love of dance, was highlighted as a connection to the root of African culture and means of survival for Africans in the Western hemisphere. 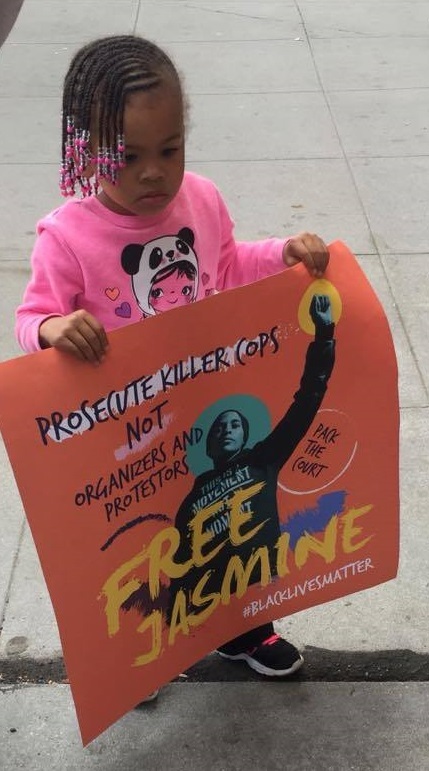 While Black Lives Matter, other activist organizations, and individual community members have been supporting Jasmine throughout all of her malicious prosecutions, the press had largely ignored the case until the sentencing hearing. Early Tuesday morning we learned that one juror, identified only as "juror 6," had written to the judge urging her to give the most lenient sentence possible. In the letter, he stated that sentences disproportionate to the crimes committed undermined his own faith in the justice offered by the legal system. Color of Change is now circulating a new petition, this one calling on California governor Jerry Brown to use his executive power to pardon the incarcerated freedom fighter. 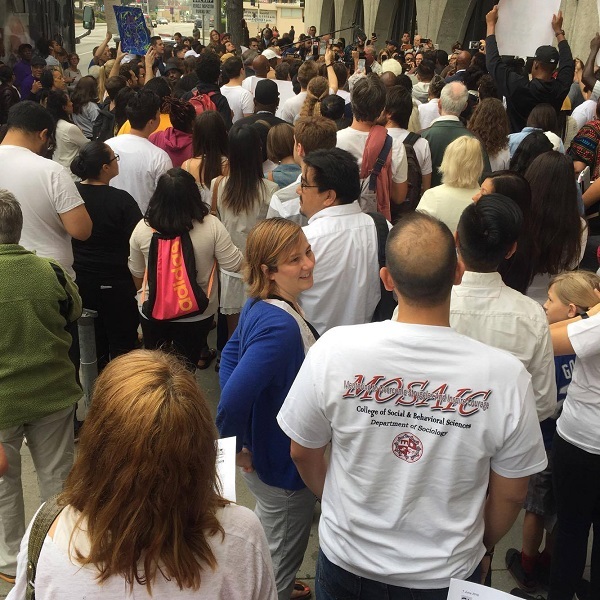 After the final press conference, many of those gathered in Pasadena mobilized to the LAPD police commission hearing to speak out about the suspicious in-custody death of Wakiesha Wilson. Ever since the suspicious in-custody death of Black Lives Matter activist Sandra Bland in Texas, in-custody deaths have been under greater scrutiny. In San Bernardino County alone, there have been more than a dozen in-custody deaths since March of last year. Indeed, the phenomenon was a driving force behind the movement to keep Jasmine out of jail and out of custody. 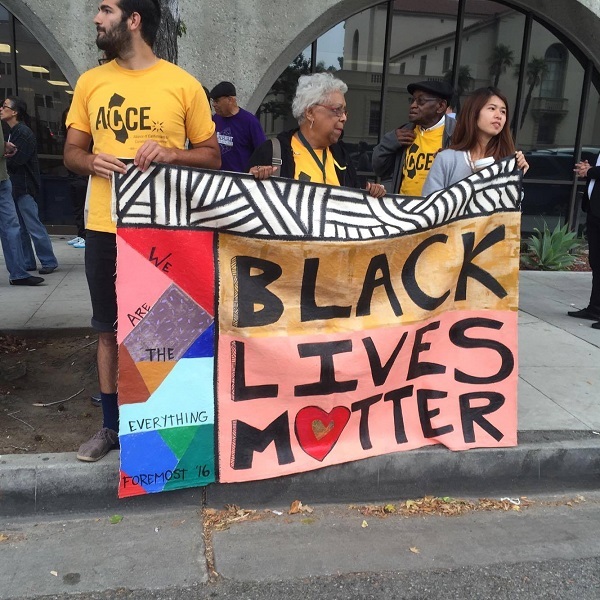 Pasadena has a long history of police violence against activists and people of color. In 2012, Pasadena police attacked and arrested numerous activists protesting former Mexican President Vicente Fox, whose government repressed indigenous Zapatista farmers and activists in addition to other abuses. And perhaps the most prominent case in recent history is that of Michael Zinzun, a black activist who lost his eye to police brutality suffered in Pasadena. This is the fucker that attacked us when we were protesting Vicente Fox four years ago. Got him working crowd control at a protest. Good move, PPD. "To Protect & Serve the *Sate* & Corporate Capitalism"
THE POLICE are _THE STREET ENFORCEMENT ARM OF WHITE RACISM AND WHITE-SUPREMACY_ in this country.